If you are interested in a workshop or casting lessons e-mail me at: jeffonthelittlemo@gmail.com and sign up or just get more information. Make sure you mention something about fly fishing on your subject line! Private casting lessons are the same as guiding rates. Since moving back to Shreveport in 2014, the availability for simple casting lessons has changed... If you are in the Shreveport area (or close enough to make it worth your while) we can hook up here in The Port! There are several places we can meet if the conditions allow, but I usually do casting lessons at one of my oldest stomping grounds - Anderson Island Park on Wendy Lane, north of East Washington in Shreveport! I am very proud to have helped literally hundreds of people with their Fly Casting techniques over the years. 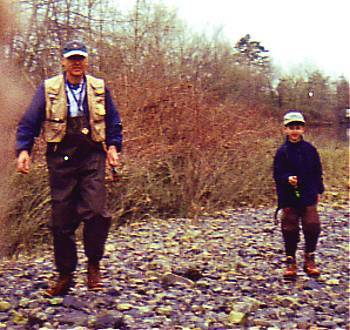 From "never touched a fly rod" beginners to more advanced fly fishers, 7 years old to 70. It has been great to see casting "click" for so many people. This started back in Shreveport when I was doing Sunday afternoon schools at my old Clearwaters Rod & Fly Shop. 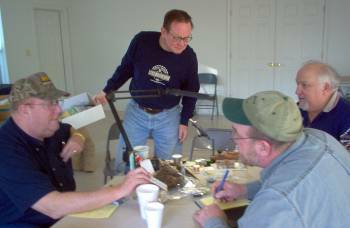 I also did extensive classes for LSU-Shreveport and Bossier Parish Community College, as well as casting clinics for clubs and other organizations around the region. Fly casting scares people to death and the sad thing is that casting is actually so simple. The thing to do is to get rid of all the stuff you don't need to do and only do what is necessary. I try to take all the mystery out of throwing a fly line so that anyone can understand it. I may even show you how to throw without a rod! I am not a "Here! Do it like this!" instructor. 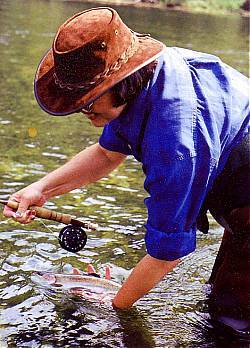 I try to make sure you understand why fly casting works the way it does. There's a little physics and geometry involved, but if I can get it, anyone can! I was never that good in science and math after all! Many people say they can cast good enough to catch fish. And that can be quite true, and, sadly, many people settle for that. But I will guarantee that you will be a better fly fisher, catch more and better fish and have a lot more fun doing it if you learn to cast well and, thereby, efficiently. You will spend more time actually fishing! I have always tried to keep my groups relatively small, two to four people, so that I can give everyone quite a bit of attention. I have done as many as 28 on one occasion, but I don't plan on doing that again. I do have a few extra rods, but if you have your own you will want to use them. The sessions were a heck of a lot of fun and very educational for everyone who came! I may have to see about reviveing the Workshops, though they won't be as nice as they were back in The Boro, since we can't get done with tying and then run out to the river to finish the day! But maybe it'll work again some time! Keep an eye on the Message Board! to see if i get those going again! As with casting, fly tying can give you lots of trouble if you don't know the truth about the techniques! Not to mention how to choose and use materials! Fly Tying is a whole 'nuther world! And, as fun as it is, it can be a little daunting at first, just like fly fishing in general. But, again, it's not that hard if you do things right! If you already have your own tying gear by all means bring it! If you haven't you can certainly come and tie with my stuff and we'll walk you through your first, second and, maybe, third fly! It's also a great way for more experienced tiers to learn how to do more advanced techniques and new patterns. There's something for everyone. And we usually get finished in plenty of time to do a little fishing in the evening!!! E-mail me at jeffonthelittlemo@gmail.com or call 870-210-3681 to make your reservations!